This is just a brief overview of some of the conditions we are able to treat using laparoscopic surgery. It is our goal to provide patients with the care and attention they need. If surgery is necessary, we believe in providing people with the least invasive option possible. Laparoscopic surgery is a highly specialized technique that our surgeons have worked hard to master. In the last 10 years this type of surgery has become widely recognized as the go-to and has expanded into intestinal surgery. Contrary to traditional open surgery, laparoscopic uses several .5-1cm incisions, otherwise referred to as ports. At each port a trochar is inserted, which is a tubular instrument designed to get into the area of concern. Once this tube is inserted a special camera - known as a laparoscope - is passed through the trochars, giving our surgeons complete control and precision. 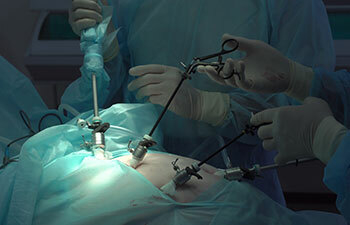 The laparoscope then transmits what it is seeing to high-resolution video monitors. As you can imagine, this is an extremely effective technique for treating common conditions that gives our surgeons complete control. Minimally invasive laparoscopic surgeries have a much lower conversion rate to open procedures, which is just one of the reasons we offer this service to our patients. If you are interested in learning more about this innovative technique or would like to find out if the condition you are dealing with may be treated using this surgery, please contact Surgical Associates of Mansfield. Our talented team of surgeons have years of training and experience and proudly offer laparoscopic surgery to treat common conditions. In comparison to traditional open surgery, the majority of patients experience less pain and discomfort, a shorter recovery, and less external scarring with this type of surgery.